The exhibition that opened this week at the Grolier Club in Manhattan, “Aldus Manutius: A Legacy More Lasting Than Bronze,” gathers nearly 150 Aldines, as books from the press Aldus founded in Venice in 1494 are known, for a more sober tribute. Gutenberg may have invented the moveable-type printing press, used to create his monumental Bibles. But anyone who has ever sat in a cafe, or in the bath, with a paperback owes a debt to Aldus and the small, cleanly designed editions of the secular classics he called libelli portatiles, or portable little books. 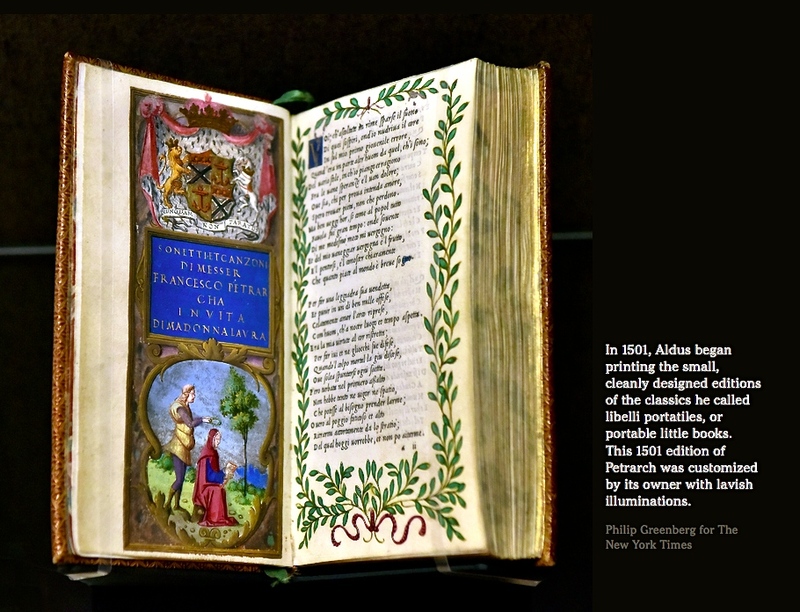 via A Tribute to the Printer Aldus Manutius, and the Roots of the Paperback – NYTimes.com.